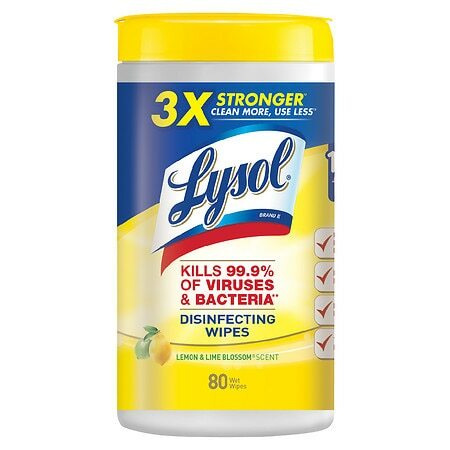 "Kills Flu Virus** 4 In 1 Disinfecting Wipes with Micro-Lock® Fibers Kills 99.9% of Germs** Tough on Messes For use in Kitchen and Bathroom Strong Wipes 80 Wet Wipes 7"" x 8"" Lysol® Brand Citrus Scent Disinfecting Wipes 4 in 1 are the convenient way to clean and disinfect your household surfaces. Each pre-moistened disposable wipe kills germs - even the bacteria that causes odors - wherever you use it. No bottles, no sponges, no mess. 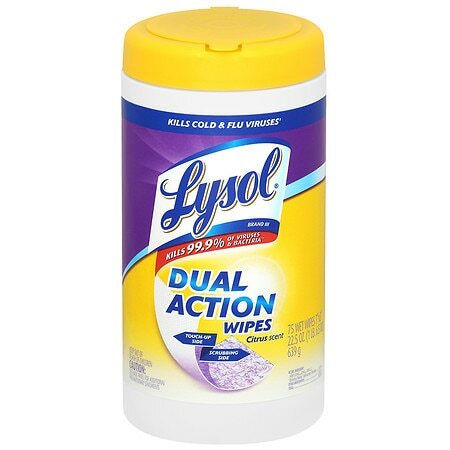 Effective disinfecting has never been faster or easier. Unplug small electrical appliances before use. Not recommended for polished or bare wood surfaces. **Kills Salmonella choleraesius (Salmonella), Influenza A (Strain New Caledonia2029) in 10 minutes. Questions? Comments? 1-800-228-4722 Made in USA"